Light Steel Structures are a versatile and customizable construction method that can be used for a variety of building projects. Light steel structures have dozens of applications from warehouses and industrial workshops to offices and grocery stores. Light steel structures combine H section steel, rectangular steel tubes, T section steel, and angle steel. This steel is cold formed and galvanized to protect it from corrosion. This steel is light weight and allows for quick building without the use of machinery or equipment. Most of the time the structures can be put together with a hand-held screw gun. The steel frame is then clad with dry sheeting on both sides to form a load bearing wall. Light steel structures are lighter in weight when compared to traditional wooden frames. Even though they are lighter than wood, they are substantially stronger. Light weight steel is weather tight, meaning they do not rot, shrink, or decompose. Using lightweight steel completely eliminates the risk of termite infestation. The use of steel is safer than wood in case of a fire or other emergencies. In fact, the steel is fire resistant for sixty minutes. Not only are light steel structures safer and more durable, they also have higher precision components and ease of build. Steel structures can be implemented for renovation projects where existing structures are not sufficient to support heavy loads. 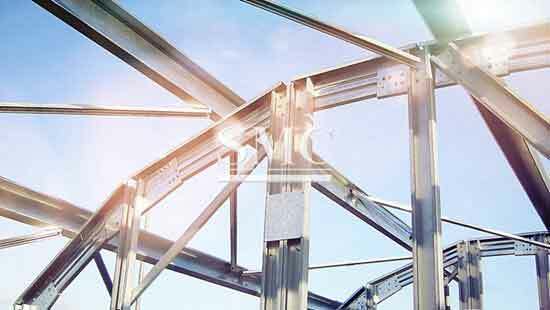 When designing a light steel structure with Shanghai Metal Corporation (SMC) it is assured that it is fully engineered and tested properly. These structures are equipped with waterproof roofs, steel wood composite stairs or solid wood, water systems, engineer flooring and more! It is guaranteed performance and full project support from start to finish. The versatility of the light weight steel structures gives freedom of design and allow for customization for individual customers needs and wants. Here at SMC the customization options are almost endless. Just to name a few, we offer multi- span low constructures that can be great for offices and grocery stores. Single-span constructures make great warehouses and sales centers. Standard- span constructures are suitable for gymnasiums. There are even additional construction options for those looking to expand or add on to a pre-existing structure. SMC has the experience and materials to go above and beyond, striving for utmost customer satisfaction every time.